includes CyberLink MediaShow 5, worth $49.95, FREE! CyberLink's Power2Go 8 is a comprehensive suite of tools which can handle all your disc burning requirements. The program is able to burn data to CDs, DVDs, Blu-ray discs, even the latest 128GB BDXL format, for instance. 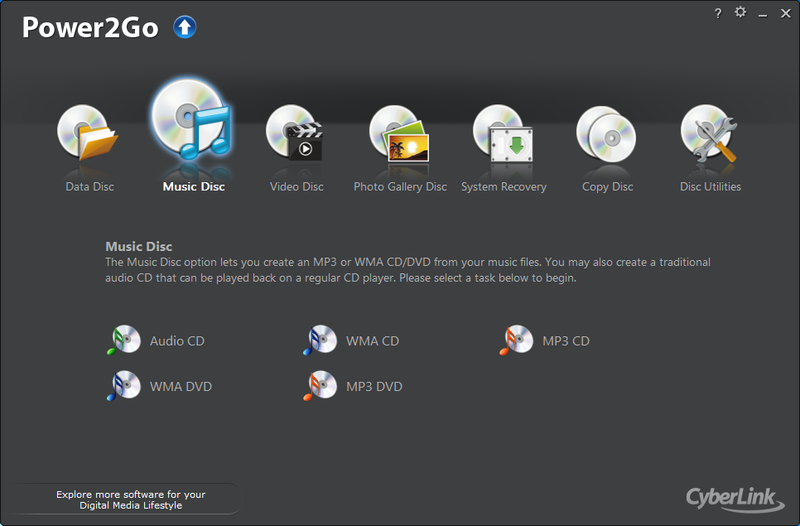 There's support for creating audio CDs, MP3 and WMA discs. The Video Disc tools allow you to burn Video CDs, DVD Videos and video folders, complete with your own customisable menus (hundreds of templates are freely available online), and most of this takes little more than a quick drag and drop and a couple of clicks. Of course many other disc burning packages will point to similar feature sets - but take a look at Power2Go 8 and you'll find the program almost always goes further. So you don't just have the option to burn data to a disc, for instance; you can also encrypt or even password-protect it, for better security. If you'd like to share some photos with a friend, you could of course simply burn the JPGs to a CD. But Power2Go 8 also enables you to create an interactive HD photo gallery, a spectacular showcase which will show your images at their best. Power2Go 8 makes it easy to burn or create disc images - but that's just the start. You can also mount them as virtual drives, meaning you can extract files and folders without ever having to burn them to disc. And there's even a powerful audio editor, which can enhance, trim and improve your music files before you burn then to disc. If you need even more functionality, though, you could always opt for its big brother, Power2Go 8 Platinum. As well as being able to create DVDs with Dolby Audio, Power2Go 8 Platinum includes a complete disaster recovery tool, which can burn a system recovery disc which includes Windows and your data files, and is able to restore the system later if your hard drive fails. It's the ultimate in disc burning tools. Important note - the trial version on this page installs Platinum for 30 days and, after 30 days, you get a much cut-down free "Essentials" version. When you purchase Platinum, you get a full build which will require you to enter your serial code (which you also receive after purchasing). The full Platinum build is 441MB.